Cufflinks might not be something that your dad will use lots and lots, but it is something that is definitely a special treat for them. You can, much like many things, choose to personalise the cufflinks, but if this isn’t something that you like the idea of, then you could instead pick classic, gorgeous cufflinks that they can treasure and use for years to come. 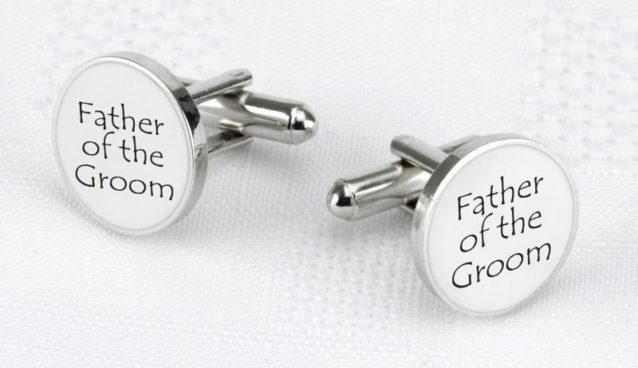 These simple white & silver cuff links make a perfect wedding gift for the Father of the Groom! 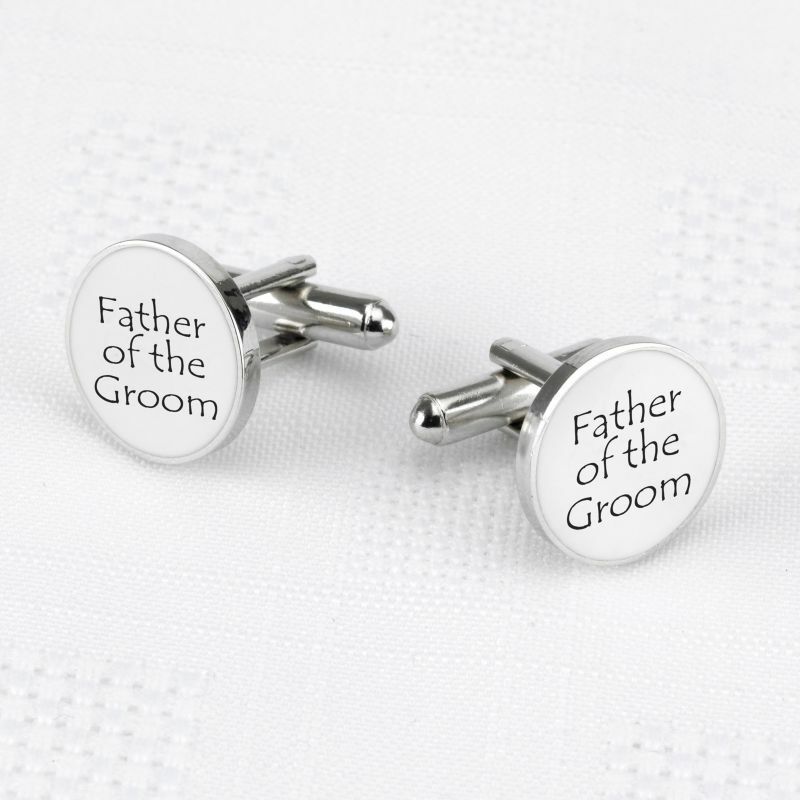 Give as a gift on the morning of the wedding and we’re sure he’ll proudly wear these as he watches you say ‘I Do’. A wedding day can be as nerve-wracking for the father of the bride and groom as it is for the couple. Which means that one of the most welcome gifts that you can give them is a personalised hip flask. Hip flasks are not only useful for the wedding celebrations, but can be something that they then choose to use long-term too. 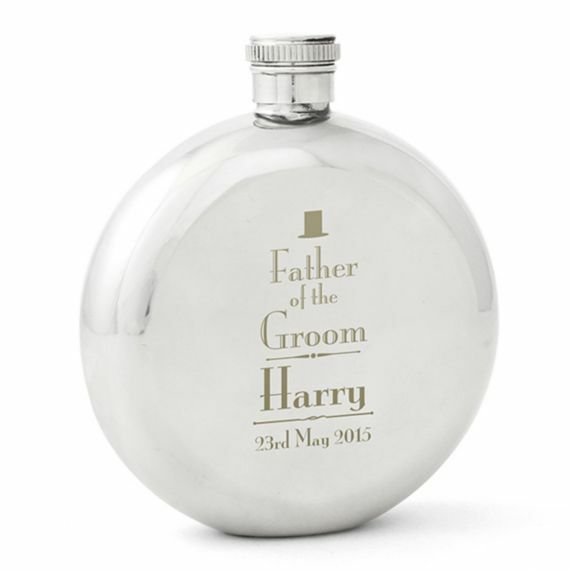 This stunning hip flask is the ideal thank you gift and keepsake for Dad! What’s even better is that it can be personalised with your Dad’s name up to 12 characters and a date up to 15 characters. 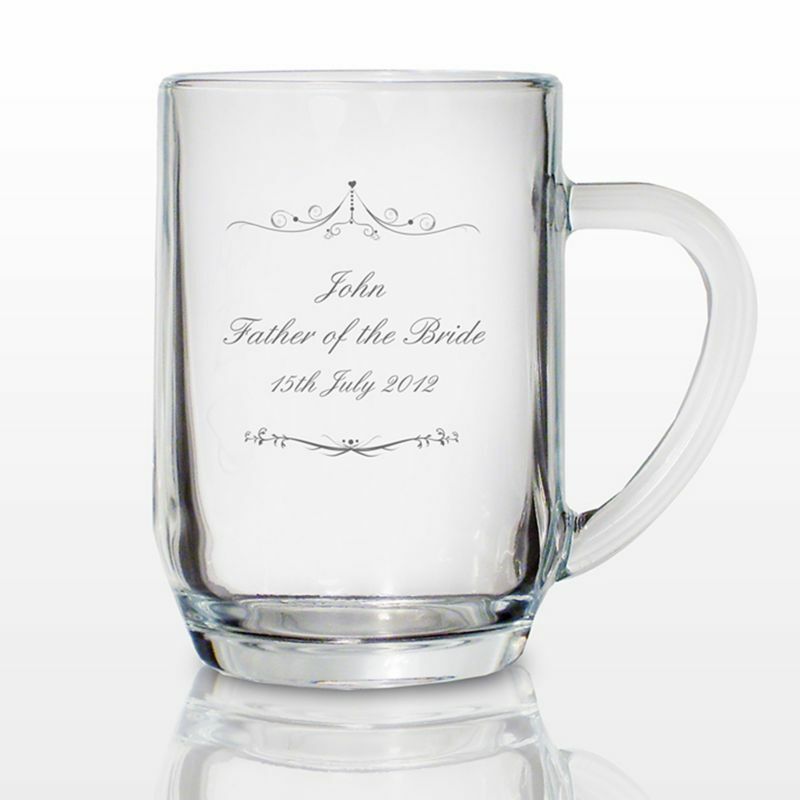 This beautiful glaqss tankard means Dad can be reminded of your wedding day every time he has a pint! Personalise with a name of up to 12 characters and a date of up to 15 characters. Shop more Father of the Groom gifts here. 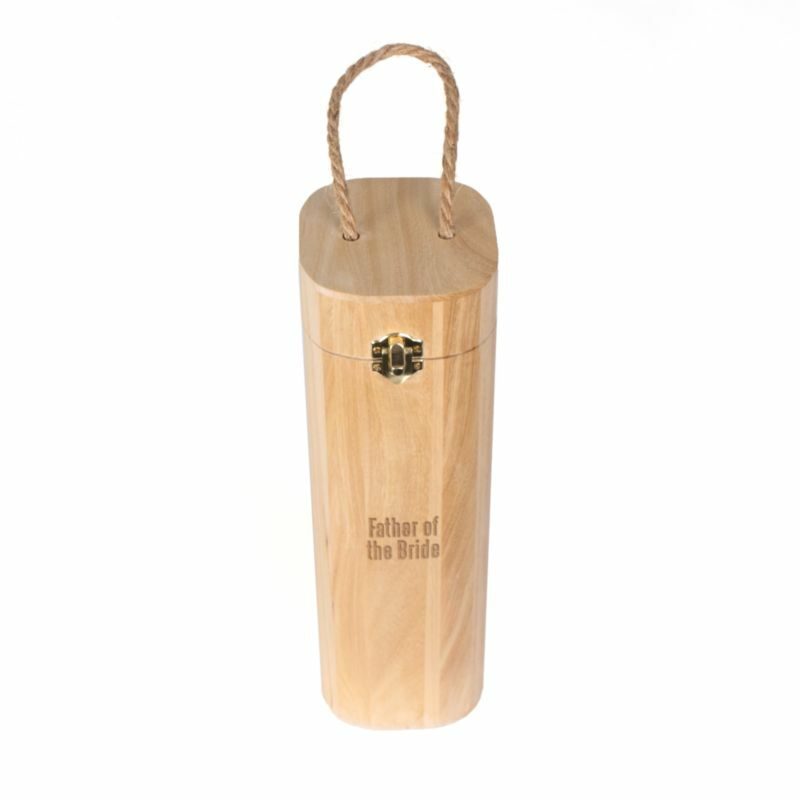 A fabulous Father of the Bride gift, this beautiful wooden box features a hinged lid with a metal clasp and a rope handle. The size of the box is 10 x 10 x 34cm. Lockets are a great way to keep a photo of someone who you love close to you, however, if you are a man then it can be hard to have a locket with you. A great father of the bride gift is to gift them with a fully personalised keyring locket. Not only can you get these engraved, should you want to, but the most important thing is to include a photo of the two of you together, which they can treasure forever. How often do men seem to lose the notes that are flying around in their pockets? If this is true for your dad, then why not use this as a chance to buy him something that is actually going to be useful? If you think that a money clip is a bit of a plain gift, then why not choose one which can be personalised? It may seem like a small thing, but it really can make the gift all the more special. Sometimes, the greatest gift that you can give someone who loves you, is simply some time together. Why not promise your dad that once the post wedding craziness has died down, you will be able to spend some time together. This could be on the golf course, out for dinner or simply doing some gardening, whatever it is that makes your dad happiest, make sure that you promise that you will be there by his side, just like he was on your wedding day. There are so many amazing gifts out there that you can treat your dad to on your wedding day, that you really should be able to find the ideal treat for them. Whether it is something that they can keep forever, that they can treasure and that will remind them of the fantastic memories that come along with your wedding day. 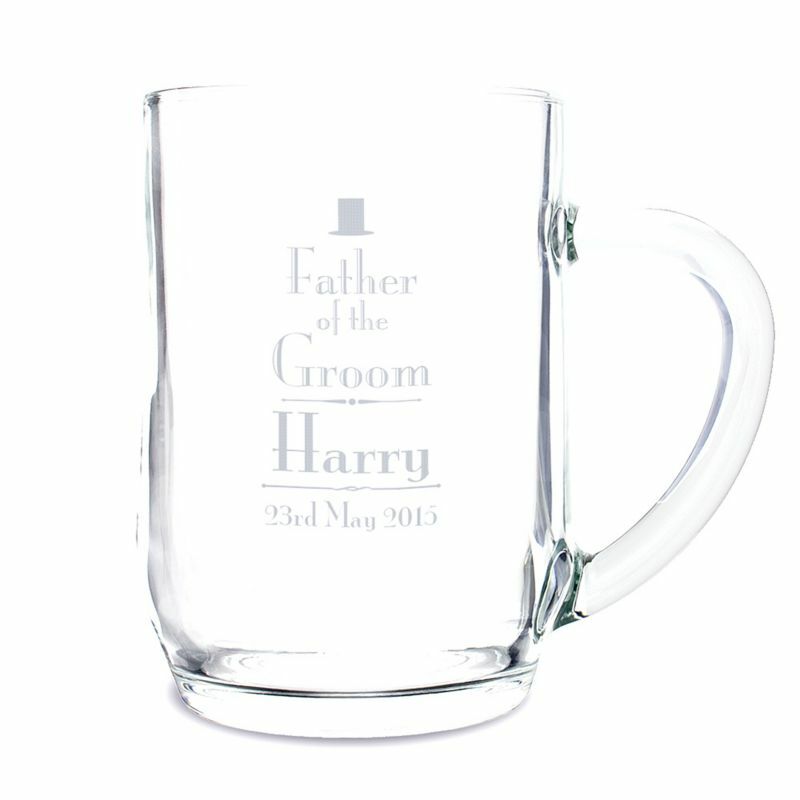 Give Dad a gift he’ll treasure forever with this personalised ornate swirl tankard glass. Personalised over three lines with any personalisation of your choice, this glass is the perfect choice! Shop more Father of the Bride gifts here.